16.5 ACRES BROWN CO. AMAZING RIVER GETAWAY! 16.5 ACRES BROWN CO. AMAZING RIVER GETAWAY! Here is a rare treat to come on the market! This river property is all set up and ready to use today. It includes all utilities on site and 2 rv hookups. It has it very own boat dock and concrete boat ramp. The property has awesome tree cover with huge pecan, oak, elm and a few cottonwood trees. 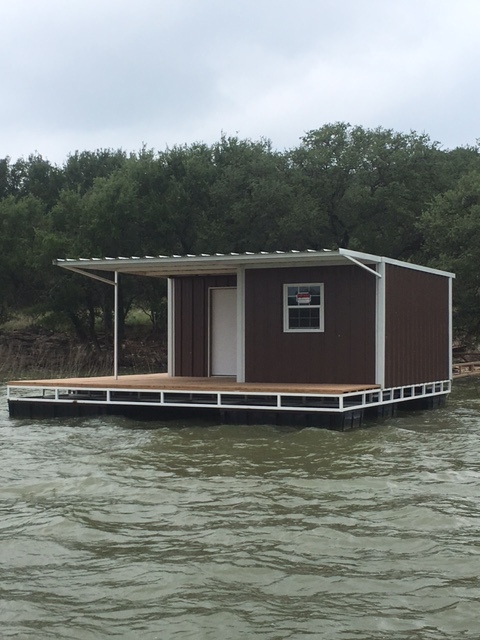 LAKE BROWNWOOD CRAPPIE HOUSE! Here is a great summer fun location that you can relax and enjoy! This floating boat dock is ready to use. It is up to date on regulations and was just updated with LED lights. It is currently located on Goat Island right across the water from the state park boat ramp. This offering consists of one wooded lot in the Woodland Hills part of Granite Shoals.It is Lot No. 574 at S8710 Woodland Hills that is .3164 of an acre (13782 sq. feet). Lot is wooded and flat with a small wet weather creek on the very back side of the lot. Lot is accessed by Woodland Hills Dr., a paved road. City of granite Shoals water is available, but there is no city septic.